San Francisco 49ers lineman Thomas Herrion died from heart disease when he collapsed after a preseason game in Denver on Aug. 20, the Denver County coroner said Tuesday. Herrion had ischemic heart disease, with significant blockage in his right coronary artery that caused the death of heart muscle, the city health department said in a news release. Herrion's heart was slightly enlarged. Drug screens on Herrion's blood and urine found only atrophine, a drug administered when medical personnel tried to revive him. Herrion, 23, was pronounced dead early on the morning of Aug. 21. The 6-foot-3, 310-pound guard was on the field for San Francisco's 14-play, 91-yard drive that ended with a touchdown with 2 seconds left. Players had finished listening to coach Mike Nolan address them in a postgame meeting when Herrion collapsed. Medics administered CPR on him and took him to an ambulance that rushed him to a nearby hospital. 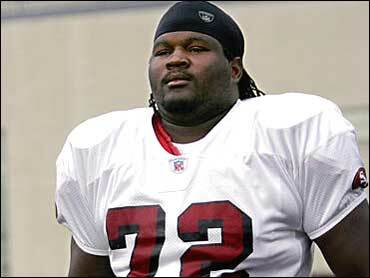 About three hours later, 49ers spokesman Aaron Salkin confirmed that Herrion had been pronounced dead. Herrion, a first-year player with the 49ers, grew up in Fort Worth, Texas, and played college ball at Utah. He spent part of last season on the San Francisco and Dallas practice squads and also played this season with the Hamburg Sea Dogs of NFL Europe. At his Aug. 27 funeral in Fort Worth, he was remembered as a player who brought joy to everyone and who was dedicated to his family, his religion and to football.